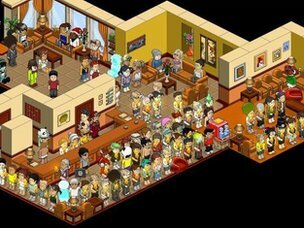 Habbo Hotel is let its members chat again as it works on ways to help protect members from sexual predators. All chat on Habbo was stopped following media reports that paedophiles were using the site to groom youngsters. Habbo owner Sulake said it was preparing for the "Great Unmute" which would let users share their positive experiences of the virtual hotel. Sulake boss Paul Lafontaine said media coverage was "distracting" it from securing the site. Habbo Hotel is a social network in which members get to control an avatar and a room that they can then customise to their taste. In a statement, Mr Lafontaine said the muting of chat on the site had led many of its millions of users to stage silent vigils in Habbo Hotel rooms to express their support. The Great Unmute would let these loyal users tell Sulake which direction they wanted to see the site take and help shape the forthcoming protection systems, he said. He added that the Channel Four investigation that led to Habbo falling silent had served as a "wake-up call" for Sulake and the industry as a whole. "We fully intend to actively participate in finding a regulatory solution that will protect our users and ensure the long-term reputation and future of the social gaming community," he said. Towards the end of the statement, Mr Lafontaine criticised journalists who were contacting Habbo users offering cash for stories about their poor experiences on the site. "Petty attempts to generate more bad news are distracting us from the job at hand," he said.